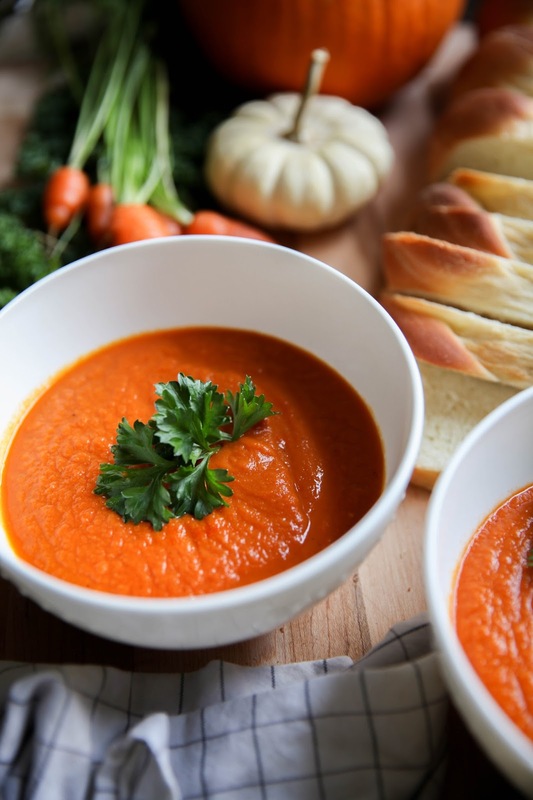 Excuse me while I curl under a blanket and eat my weight in roasted carrot soup. 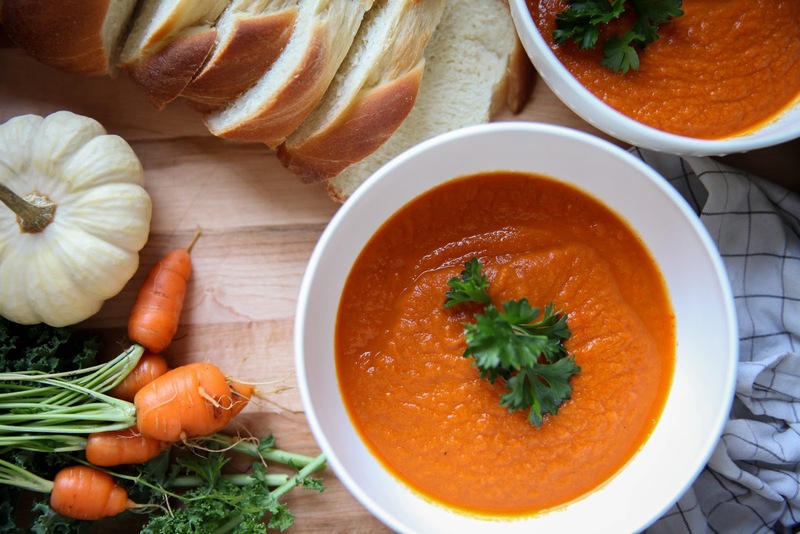 My spiced roasted carrot soup came to be on Tuesday when I found myself with an abundance of carrots in the fridge and not much else. I peeled chopped and roasted the carrots and threw in a few spices and a can of fire roasted tomatoes. 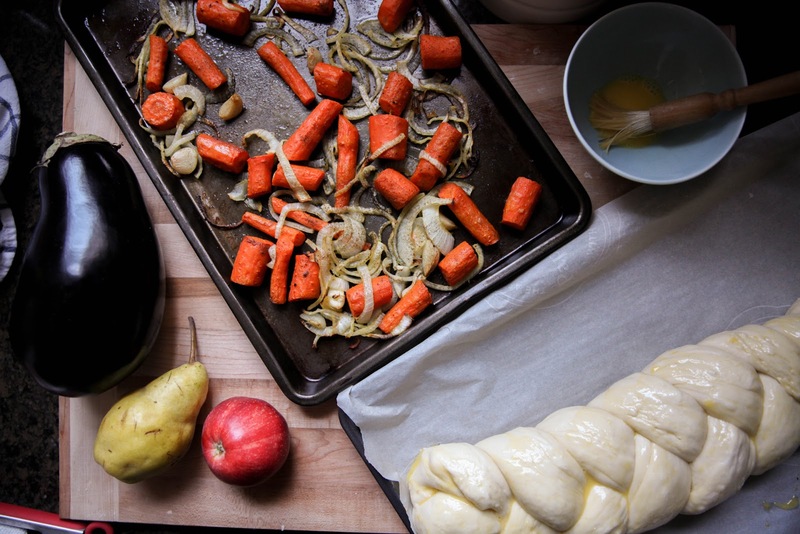 Blended it so the kids wouldn’t have anything to complain about, and served it with a few fresh pieces of challah bread and a lot of butter…A LOT. While I’d love to be the mom who oven roasts her own tomatoes, ain’t nobody got time for that in this house. So the canned ones do just fine and taste great too. It also cuts down my soup-making time to approximately 30 min, of which the oven does the majority all on its own. The bulk of the work on this is in the prep (5-10 minutes-ish) and the blending (1 minute). Annnnnd for those of you who have kids, skip the chilli peppers at the beginning. Just leave them on the side and add them at the end as a topping for yourself. The kids would probably eat this much more readily without it. 2. In a large bowl combine the carrots, onions, garlic and olive oil and toss to coat. 3. Place them on baking sheet and sprinkle with thyme, nutmeg, salt, pepper and chilli flakes (skip the flakes if you want your kids to eat it…add them individually while serving). 4. Bake them in the oven for about 30 minutes, tossing once after 15 minutes and checking for doneness starting at 25 minutes. 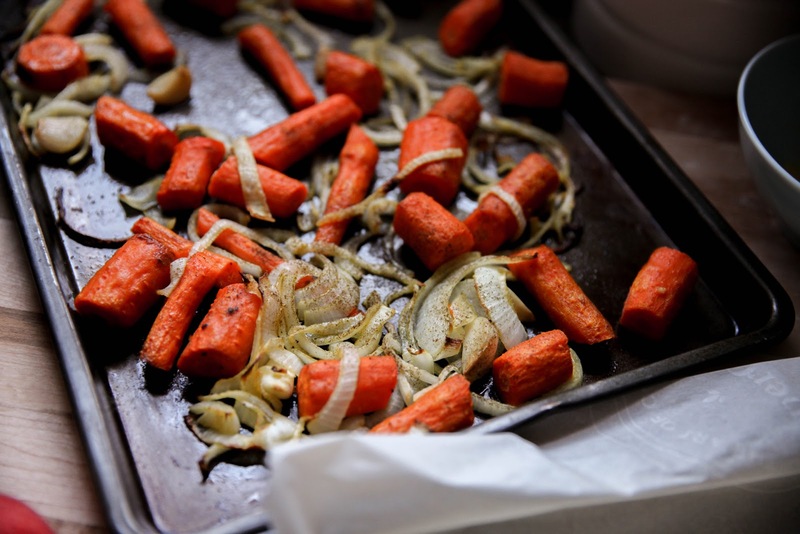 This part depends on your oven, but your veggies are done when you can pierce the carrots with a fork. 5. 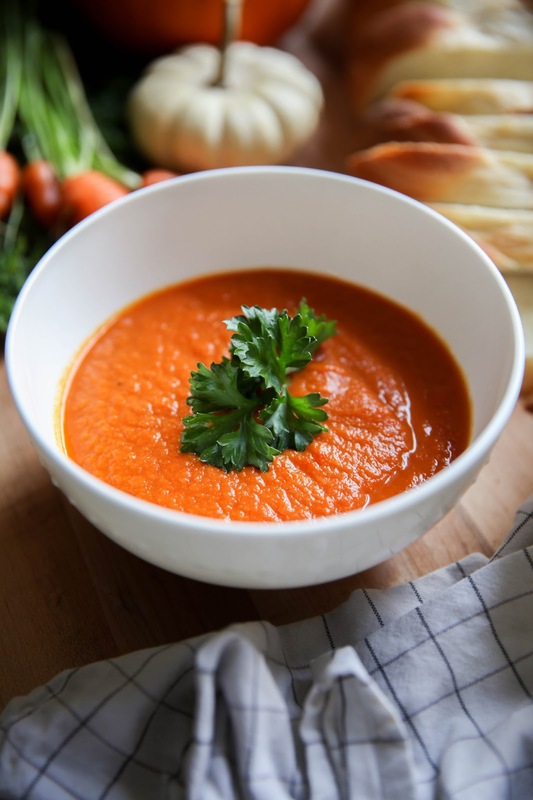 When veggies are roasted, toss them in a blender or food processor along with the canned roasted tomatoes and half of the veggie stock (approximately). Blend until smooth. 6. Pour the mixture into a pot, top with the rest of the stock, mix well and bring to a boil, then immediately reduce to a simmer, cover and let it simmer another 10 minutes. 7. Serve with chilly flakes if you haven’t used them already, some fresh parsley, and even a dollop of sour cream if you like.